Please visit the workshop's website to view the Call for Abstracts. As in the past, the workshop is open to all aspects of nanomechanical and nanotribological testing, including biomechanical, in-situ experimentation and simulation/theory. The abstract submission deadline has been extended until March 20th. In addition to keynote/invited/contributed talks, there will be a student talk competition open to anyone who is a student at the time of the workshop as well as a poster competition open to everyone. Congratulations to 2014's winners Aaron Kobler, KIT (best student talk) and Václav Pejchal, EPFL (best poster)! Conference registration includes the conference banquet and awards, lunches, coffee and snacks, and an evening of beer and sausages. We wish you a splendid 2015 and look forward to seeing you in Potsdam this April! 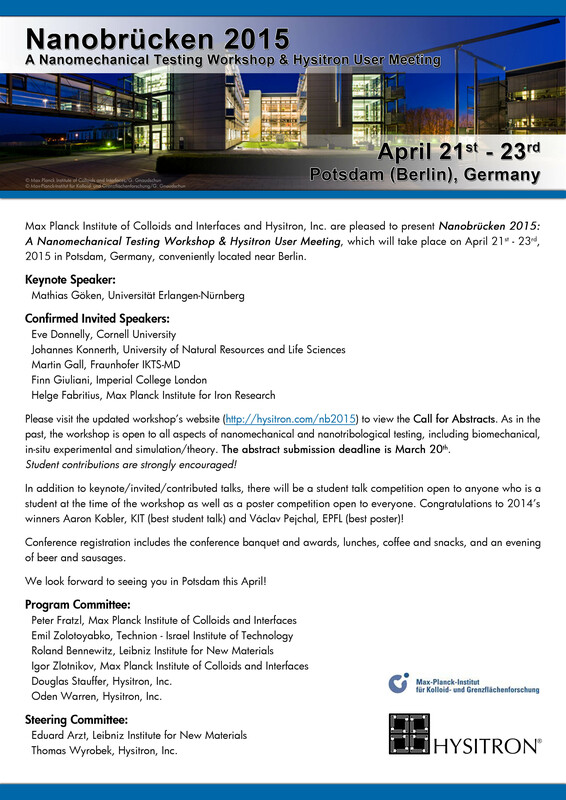 Your Nanobrücken Program Committee: Prof. Peter Fratzl, Max Planck Institute of Colloids and Interfaces / Prof. Emil Zolotoyabko, Technion - Israel Institute of Technology / Prof. Roland Bennewitz, INM Saarbrücken / Dr. Igor Zlotnikov, Max Planck Institute of Colloids and Interfaces / Dr. Douglas Stauffer, Hysitron, Inc. / Dr. Oden Warren, Hysitron, Inc.
Permalink Submitted by Douglas Stauffer on Tue, 2015-03-03 10:00. The abstract submission deadline has been extended to the end of DPG / TMS. See you in Potsdam!